From the cellar: Remember in 2008 when the 2005 Bordeaux was released as the best release in decades and hordes showed up at BC Liquor to max out our credit cards? Fast forward to the 2009 release billed as the best release in decades and… Oh wait, do I smell a bit of marketing politics or the incessant need to get excited about wine in a world with so much wine it’s hard to get excited? I am certainly not anti-Bordeaux, I’ve got a wine fridge filled with the crap, it’s just that, a bit like those “For Your Consideration” pre-Oscar ads, there seems to be more hoopla than substance. 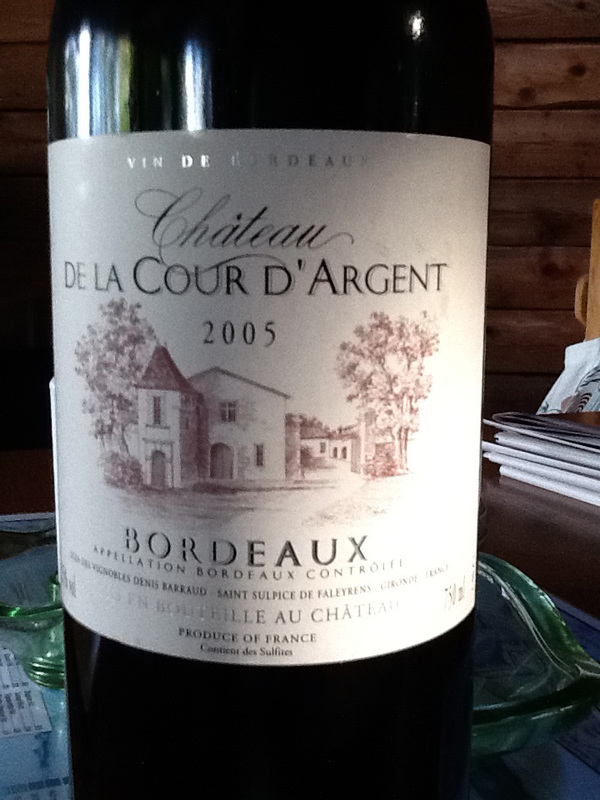 So, today, a simple inexpensive 05 Bordeaux. Cab Sauvignon, Cab Franc, Merlot. Mostly merlot. OK. You’ve read enough. A lesser known Bordeaux in keeping with an ongoing blog theme of quality for a decent price in an over-priced government-controlled wine market. (If there’s one place I’d love to see Tea Party momentum, it’s govt control of vino, but that’s never gonna happen in BC…) The de la Cour D’Argent is dark and complex but not overwhelming or intriguing. Weird oxymoronic Bordeaux. On the one hand, it’s the antithesis of everyday, approachable CA and OZ reds, what we’ve become accustomed to with the prevalence of the point system (which, ultimately, results in a tiny percentage of individuals setting taste standards for millions). This is highly nuanced on the finish with some hot pepper and smokiness that’s desirable but not dramatic. It seemed lacking in “elan” or “joie de vivre” or whatever the con-no-sirs say. If I could be so ridiculous as to call it contemplative, and you would read that with a straight face, and then if we would both indulge in a long conversation about what we’ve come to accept as blended red and expectations and the international wine market with references to Mondovino, then the whole point of this blog being about good wine and everyday tastes would be for nought. Price: $19 in 2008 with 88 points from the Wine Spectator. Should I factor in the wine cellar space and electricity bill for the last three years? Market Liquidity: Only bought one bottle, so nothing lost, nothing gained.